May I present you a new game this week. 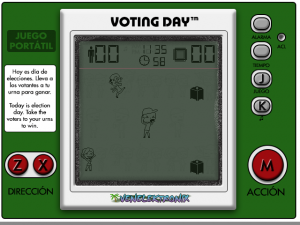 It’s called Voting Day and it’s my contribution to encourage all Venezuelans to go vote on next April 14th. The game is based in the old Game&Watch series of games, so the way to play is simple. Share it with your friends. For web browsers in desktops, cell phones and tablets.